A Total Solar Eclipse is a rare astronomical event, and it is even rarer for one to occur close to where you live. Those of us who live in the Pacific Northwest of North America will be favoured with such an event happening near us on August 21, 2017. In fact, everyone in North America is within striking distance of being able to observe this amazing event, where the Moon slides in front of the Sun for a few brief minutes, suddenly and totally obscuring the Sun. If you haven’t observed a Total Solar Eclipse, this is your chance! 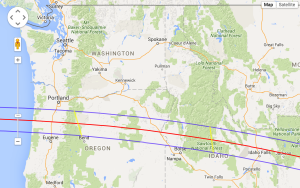 The eclipse tracks across Oregon and Idaho, making it easy to get to the eclipse totality track from Victoria, British Columbia with one day’s drive. The major cities of Portland and Eugene in Oregon are obvious targets for those of us who are eclipse chasers. I-5, an Interstate highway, crosses the eclipse centreline at the city of Salem, Oregon as the eclipse tracks eastward across the U.S.A. So you might decide to stay in Portland or Eugene, but you will have to drive to the centreline, otherwise you will miss the eclipse! NASA’s Eclipse website gives all the facts and figures required to find and enjoy the eclipse, including an interactive zoomable map showing the eclipse track. Why this location? Well, if you look at the weather predictions and the track maps, you will see this location is easiest to get to from Victoria, and offers a decent chance of clear skies. Simply take a ferry to the mainland, and drive down I-5 to Oregon. This location is away from the coastal clouds, even though there is better weather available if you drive eastward through Oregon and possibly into southern Idaho. You can also seek out more scenic locales such as Wyoming, however now you will be traveling much further. What if you can’t travel to the track of totality? You can still see a partial solar eclipse from anywhere in North America. Use NASA’s Interactive Eclipse Map to get the calculated timing for the eclipse in the area you plan to observe from. Click and zoom to your area, then click on your observing spot to see a popup telling you how long the eclipse will last and what you will see. Weather always plays a big part in any solar eclipse, so being mobile is key to improving the odds of actually seeing the event should clouds threaten to obscure the Sun at the critical moment. Our very own Jay Anderson (former RASC Journal editor) is a weather expert, and specializes in forecasting weather for solar eclipses. His Eclipse website offers sage advice backed up with maps and charts depicting weather prospects for each eclipse happening in the world for the next several years. 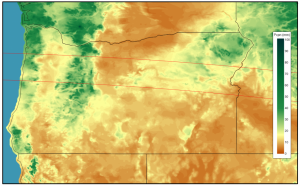 Read Jay’s analysis of the area you propose to observe from, so you understand how the weather might behave on eclipse day. Topography, elevation changes and local factors play into how the weather evolves throughout the day for a particular locale. Become a local weather expert, and you increase your chances for success! Observing a Total Solar Eclipse is pretty easy, however that said, if you haven’t done it before, it’s nice to have experienced eclipse observers around to guide you through the process. Obviously the time of total eclipse is the main event, however other things happen beforehand, afterwards, and during an eclipse that are worthwhile. You should try out any gear you propose to take with you before you leave. Make sure you have proper solar eclipse filters for any binoculars, camera lenses and telescopes you are bringing along. Take test photos of the Sun weeks before you leave, so you know your photo gear will work as expected. Always have a backup plan for when (not if) gear breaks, or you simply can’t get it to work properly. Remember, you only have a couple of minutes to see this event! Finally, relax and enjoy the day. Arrive early. Try to manage your stress level. Just sit back in a reclining chair, have your solar glasses handy, and enjoy! DIY Box Pinhole Projector – to safely observe the eclipse with only a box and some aluminum foil! If this will be your first time observing a total solar eclipse, no doubt you have many questions and concerns, and don’t know where to start. The resources presented here may be overwhelming. Please ask any questions you might have about eclipses at Astronomy Cafe, held each Monday evening. 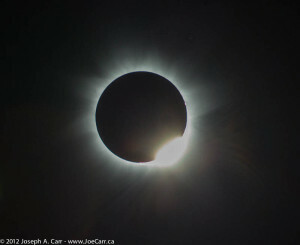 Your fellow RASC members have observed solar eclipses before…they can help! RASC Eclipse 2017 – a scenic holiday to the midwest USA, a solar eclipse, and sponsored by RASC!